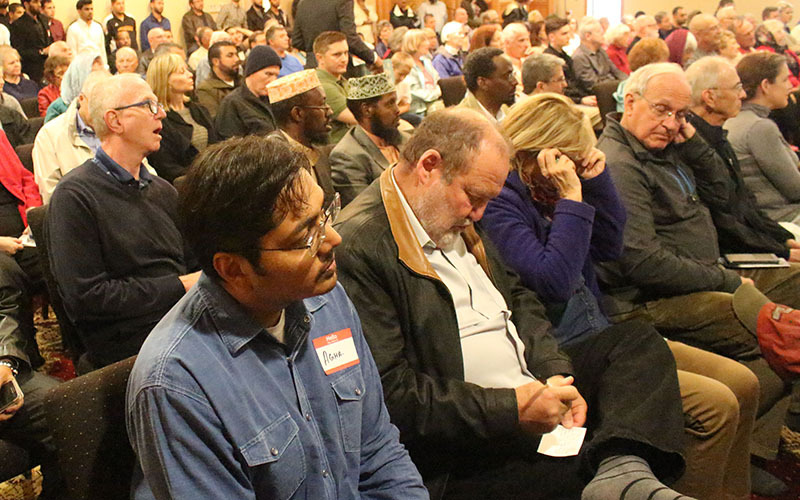 GLENDALE – Glendale resident Steven Lane had always wanted to know more about the mosque that moved into the former church down the block. Lane and two children joined 200 people of different faiths who walked into a mosque, placed their shoes against the wall and heard an Arabic prayer before listening to leaders discuss Islam. Listeners walked out knowing more about the centuries-old faith, dampening stereotypes about the religion’s juxtaposition to terrorism. The United Islamic Center of Arizona opened the doors to the mosque near 35th avenue and Union Hills Drive last weekend to reveal information ranging from basic, such as differences between a Sikh and and a Muslim, to more complex questions, such as women’s rights within Islam. Didmar Faja, the mosque’s Imam, said an open house is important because it allows the community to get a real sense of Islam, rather than what terrorist groups portray. Taj Jones, a center trustee, said in an interview the event was intended to reveal community connections. What is the path to becoming an Imam? How should Muslims treat non-Muslims? How does the Quran’s teachings compare to Judeo-Christian teachings? Phoenix City Councilwoman Thelda Williams, who was on the panel, talked about religious tolerance. Ann Range, an 83-year-old Glendale resident, came to the open house because she has Muslim friends in her book club and wanted to know more about the culture.